Cosy, well laid out and comfortable cottage. It was very clean and had everything we needed for a wonderful stay. Thank you. Great week stunning location super walking on the coastal path and a pub next door to boot. 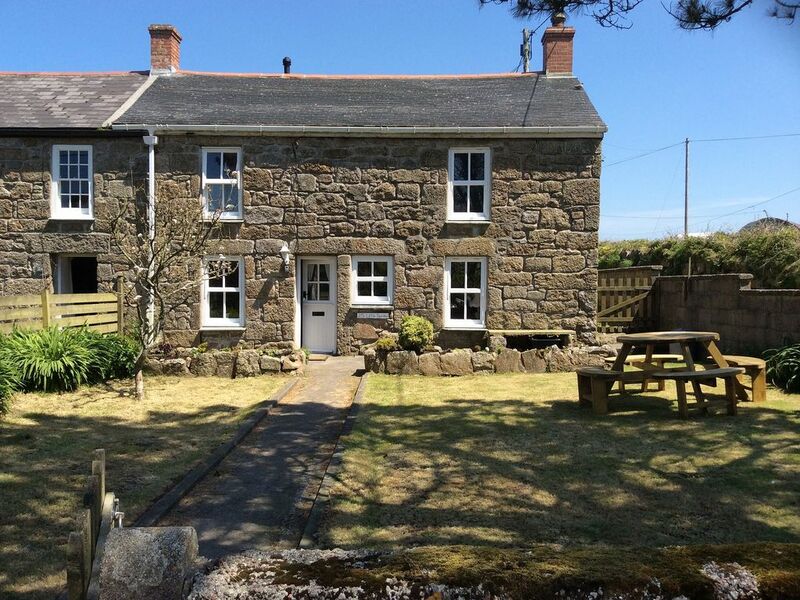 A charming cottage next to a lovely pub and 2 minutes walk from the stunning coastal paths. This is a lovely authentic tin miners cottage. The front garden was ideal for the children to play in safely although take care as the front gate opens straight onto the road which is quiet but is on a bus route. The pub next door does great food but book a table to be sure of eating there. A short walk takes you to the fantastic coastal path with its old tin mines and amazing views of the coastline. The cottage is 15 minutes from Penzance and about 25 minutes from St Ives so is in a great location. We had a great holiday. A cosy and quaint Cornish cottage next to the very pleasant pub and 5 minutes from stunning cliff walks. We had an amazing ramble along the coast to the beautiful beach in Portheras Cove, not to mention lovely days in St Ives, St Michaels Mount and various other local attractions. A lovely cottage to come home to, space for all 6 of us, including two rambunctious small boys, and delicious apples on the tree in the garden. Thank you for letting us borrow your lovely Cornish hideaway! Thank you for your great review, we're very happy that you enjoyed your stay in Little Ferriby and look forward to welcoming you again one day! A wonderful family holiday in a cosy cottage, scones, jam and cream were waiting on arrival on a blustery day which changed into a warm sunny week. Brew, our boxer dog, loved to sit at the door watching the world go by and our tortoise loved to wander around the garden eating the dandelions and plantain and watching everything from the garden gate! The Queens Arm was just along the road and the walks around this stunning area were right on the doorstep. Botallack Mine was a 5 minute walk away, or if you're feeling lazy there is a large National Trust car park with a small café and tables to sit outside and enjoy the amazing view, the coffee was delicious. Thank you Maureen, Nick and I, and Brew of course, will definitely be back. THIS IS THE MOST COMPREHENSIVELY EQUIPPED COTTAGE WE HAVE EVER HIRED. NOT SO MUCH A HOLIDAY LET AS HOME FROM HOME,ONLY THE MOST PERNICKETY COULD FIND A PROBLEM. ALTHOUGH IT HAS ALL MOD CONS IT RETAINS ITS COTTAGE CHARACTER AND ATMOSPHERE. OURS WAS A FESTIVE SEASON HOLIDAY AND WE FOUND ON ARRIVAL,CHRISTMAS DECS INCLUDING AN ILLUMINATED TREE,MINCE PIES AND A BOTTLE OF BUBBLY. THE COTTAGE IS DOG FRIENDLY AND THE GARDEN IS ENCLOSED. FIVE MINUTE WALK TO THE HEADLAND,GREAT FOR DOGS AND OWNERS ALIKE. Newquay ja Exeter lentokentillä helpon matkan, 30 mailia ja 120 mailia vastaavasti.